Excellent Delta Redfish Action Continues! Just returned from another great trip to the Delta with angling friends Gary Clark and Jeff Stagg. Among other trips for each of us, these late June dates when we meet up at Camp are our favorites. Seasonal conditions are usually about as optimal as possible the last week of June. This trip proved to be no different except for the unusual local weather pattern that presented itself on day two. But hey, we take the good with the "other" and are blessed to enjoy this incredible fishery. 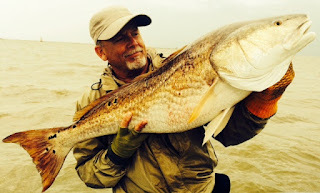 Gary's report below describes our three days fishing with our friend, Captain Keith Kennedy who operates Born to Fish Charters out of Venice, LA. Gary takes the prize for the Red with the most spots this trip. "Boy, was it hard to believe the marine forecast for the first day of our latest trip to Louisiana to fish with Captain Keith Kennedy of Born to Fish Charters. Waves of 0 to 1 foot, which is simply unheard of! But, sure enough, that's precisely what met us when the Captain reached the spot he wanted to fish. Within moments, everybody was hooked up to a big redfish all going in different directions! For the next several hours, to have triple and quadruple hookups, all it took was having that many baits in the water. When the dust settled---or rather, the water calmed from all the action---45 bull redfish to 28 pounds (Jeff Stagg) had come over the rail. As always, with that kind of fishing on the first day, you just can't wait for the second day. Then, as so often happens, what a difference a day made. Trying his best to put us into fish early, the Captain made our way all the way down to the Head of the Passes on the River. At that point, storms on both sides of us made it very clear that the prudent course of action was to return to camp, and that's precisely what we did. Late morning we headed out again, but the second day's fishing was nothing like the first day. We fished really hard for a total of two bull reds! Then came the finale! On the third day, we returned to the original scene of the crime, and it was game on all over again! Another storm caused us to seek shelter, but after it passed, the Captain made the right decision to return to where all the action had been, and sure enough, doubles and triples were on again! We finished the last day with a total of 40 redfish, and David Fields nailed the big one of the trip at 34 pounds (pic attached). I managed a nice red with more spots on both sides than I have ever seen. Another Giant Red from the area know as "Dead Womans Pass"
Before I reveal the best lures for this outing, let me just say that this latest trip exemplifies why it's so good to book Capt. Keith's 3 day, 4 night all-inclusive package. Booking only 1 or 2 days can be very hit or miss. With 3 days of fishing, it's usually for sure that at least one of those days the weather and the fish will cooperate. It's not uncommon for 2 days to be good, and if you get all 3 to be good, you can consider yourself to be very fortunate. Now for the lures. As has been so often the case, the El Grande "Boom-R-Ang" saltwater fluke bait in Foxy Fred color was just exceptional. (See FYI below) Bomber mudminnows in white with chartreuse tail also did their thing. A new wrinkle developed by the Captain calls for two H & H queen cocahoe minnows to be arrayed on the same 8/0 circle hook, and this produced quite well. Jeff Stagg upped the ante on this rig by replacing the minnows with two 6 inch twister tail grubs. On the last day, all he had to do for an immediate hookup was to get this rig close to the water! And I must mention that the Captain caught a very nice bull red, field testing his new lure creation, the Rag Tag. No doubt you will be hearing big things to come of this innovation! As always, I hope all our fishing buddies can enjoy this fantastic fishing with the Captain for about 1/5 the cost of our international travel! Bass wishes, Gary Clark"
Jeff claims the title for longest Red of the trip! Interested in a Rendezvous with some Giant Reds?